Shop Calvin Klein Eternity Eau De Toilette Spray For Men (3.4 oz. )3.4 oz. Shop Calvin Klein Eternity for Men Aqua Eau De Toilette Spray (1.7 oz. )1.7 oz. $6400$64 and 00 cents$37.65 / oz. Shop Calvin Klein Eternity Eau de Parfum Spray (1.7 oz. )1.7 oz. 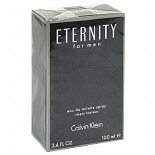 Shop Calvin Klein Eternity for Men Eau de Toilette (1.7 oz. )1.7 oz. For both men and women, Eternity fragrance offers a distinct and clean scent. You can stock up on this Calvin Klein fragrance for yourself or get it as a thoughtful gift for someone who's complimented you while wearing it. There are different bottle sizes and spray types as well as several varieties of Eternity fragrance to choose from here at Walgreens.com. You can narrow your search for Eternity fragrance by deciding between eau de parfum and eau de toilette sprays. Made with a higher concentration of fragrance, eau de parfum sprays require just a light application to last throughout the day or evening. Eternity eau de toilette offers a more subtle and light scent. You can find both Eternity for men and Eternity for women in different size sprays. If you're shopping for a gift, you can browse our larger assortment of additional fragrances from Calvin Klein. With multiple forms of the same scent, fragrance gift sets make it easy to layer a fragrance for lasting wear. We carry popular scents such as Eternity, Obsession and CK One for both men and women.